"Yo no soy marinero, por ti seré." I wanted to be like Popeye. Popeye was strong, smart, and funny, and he had a lot of fights he always won. And Popeye ate spinach. He ate it all the time out of cans that were always around. And then he got superstrong and really, really big forearms. I figured if I got that strong I could get big forearms and win when my brother hit me instead of him winning. So I asked Mami. 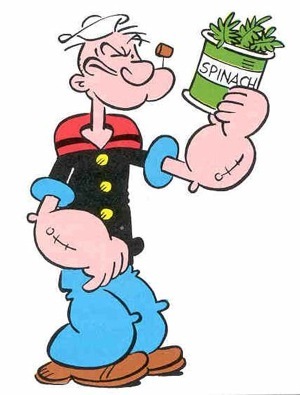 “Mami, can you get me some spinach?” I knew my brother wouldn’t want any because he didn’t like Popeye. Visions of beating up my brother filled my head. So, a few days later Mami came back from King Charlie with a can of spinach. It wasn’t exactly like the cans that Popeye ate from in the cartoons. This can was smaller, and the spinach on the front looked dark green like old dark snot. The spinach on the can looked like nothing I had ever eaten before. But then I imagined my brother flying across the room unconscious after one of my mighty punches. She made fried chicken and spaghetti for dinner. But she said I had to eat the spinach first because I had asked for it. She heated up the whole can. When she put all the food on the table, she put a bowl of the hot spinach in front of me. It looked just as dark green as it did on the can. I didn’t want to eat it. I did, I did. But it looked like something from the garbage. It smelled like that too.“Don’t waste it. That cost money,” Mami said. I put my fork in. The spinach was made of long leaves. I got as small a piece as I could on my fork and put it in my mouth. I told them it was good. I knew Popeye was just a cartoon. But I thought maybe, maybe I would get a little stronger. I put another fork and took out another small piece. I didn’t feel any stronger. I felt weaker even. I felt smaller. I made Mami buy the can, and we couldn’t afford to waste food. I put another fork in my mouth. Mami got up and came to my side of the table. “You don’t like it?” Mami asked. “I knew,” she said. She took away the smelly, snot green spinach. She served me some spaghetti and chicken. Then she sat down with the bowl of spinach that was getting cold and started to eat it. I felt really bad. And I wasn’t any stronger. I would never be stronger. My brother would always beat me. I hated spinach and promised myself I would never eat it again ever. Previous PostPrev Post January 2011 Issue of Asinine Poetry Is Up!